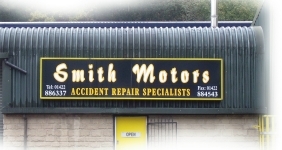 Smith Motors has been established since 1990 and we have over 70 years of bodywork/accident repair experience so you can be sure that your vehicle is in excellent hands should you have just had an accident or need your pride and joy repairing. Any Insurance work can be undertaken. We are able to carry out repairs to most vehicles from Motorcycles to Light Commercials. Full Restoration projects can be completed on-site. We have vast experience of repairing Accident Damaged vehicles. We have full Low Bake Oven facilities. Please contact Ewan or Mark for a no obligation, FREE verbal on-site Estimate.